A quick glance at the board and you’ll know exactly what kind of game Tzolk’in is. Right away. The kind of game covered in strange and unusual symbols, like ancient hieroglyphics. There are no words–literally. No words on the board at all. Cubes and other bits of wood lie about, and a score track borders the main board. Yes, this is a capital-E Eurogame, and a very good one at that. 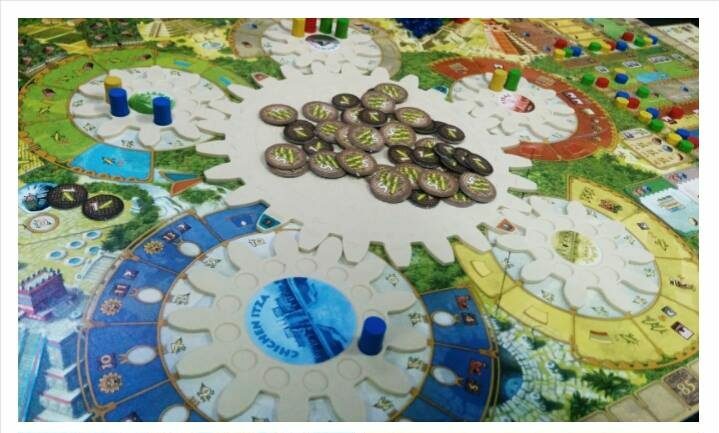 On top of (literally) all of the meaningful symbology are even more runes on the giant gears that make Tzolk’in so visually unique and generally rad. They also serve as a nearly, but not quite, too on-the-nose metaphor for the existential dread housed in this kind of game–gears grinding, mechanical efficiency, time inevitably progressing, etc. 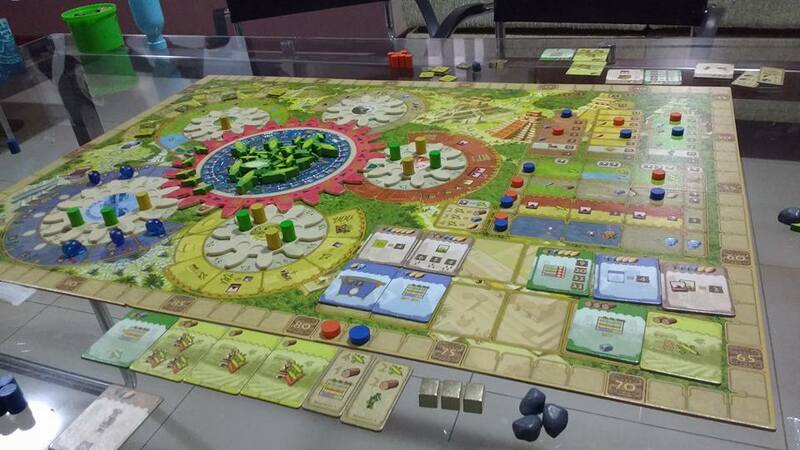 Also befitting the genre, Tzolk’in is a game of resources and economics. You invest workers to gather resources and then turn those resources into other resources, or buildings, or skills, or monuments, or favor with the gods. At some point, through various mechanisms, those things turn into victory points. You know the sort. You also, as you might have suspected, need to periodically feed your workers or lose some points. So it’s a grindy euro with lots of cubes. We’ve seen many of these, and familiarity isn’t always a positive thing. What makes Tzolk’in stand out and be a good example of the genre? The gears, for one. Not only do they look cool, but they help visualize the time-systems of the game itself. Yellow is kind of a hodgepodge gear of fun things, from gaining more workers, to buying the god’s favor with corn, to….constructing buildings out of corn? Don’t question it. Yellow also contains a space that lets you go to pretty much any other spot on the other gears at the price of, you guessed it, corn. And most importantly it has the space that lets you exchange your resources into corn and vice versa at a fixed exchange rate, as much as you want. In a tightly constructed mechanical euro this seems like quite the extravagance, but alas. Finally there’s the blue gear, where you can drop off your skulls for a handful of points, some favor with the gods, and maybe even a resource. It’s a lot to take in at first, not only because of the pure quantity of potential actions, but also because of the aforementioned symbology. Fortunately, from a graphic design standpoint Tzolk’in is excellent, and you will be able to remember what everything does fairly quickly into playing. But the difficulty in this game isn’t in learning the rules, it’s in navigating the mechanisms themselves. You ultimately want victory points, but there are different ways to get points–skulls, buildings, monuments, and the temple track primarily. And each of those methods requires multiple steps to even reach the point where you finally get to move your pawn off of the “0” space on the victory point track. This means that the game requires, for even competent play, a significant amount of foresight and planning ahead. You can’t casually waft through this game and end up with a decent score; this is closer to Agricola than Viticulture. However, I have found that you don’t have to suffer through egregious amounts of mental strain in order to feel accomplished. See, I took about a 2 year break from playing Tzolk’in. After I first got the game, I played a couple of times, not quite understanding how to effectively translate my actions into points. I did alright, I thought, but I wanted to unlock the strategic secrets housed within this system. So I went online. I saw that Board Game Arena had an implementation and jumped in a game. It was a slaughter. These people were on a completely different level–one I didn’t even know was possible. I then checked out the BGG strategy forum and discovered that the most popular high-level strategy was hilariously titled “big corn” and involved certain types of skill increases, followed by ridiculous numbers of resources, combined with the “exchange whatever you want” action to get loads of corn, or whatever resources you wanted to buy buildings and stuff. I was so out of my league that I only remember the bare bones of the strategy, and even after looking at examples of it I couldn’t really pull it off, especially against other people who know what’s what. That turned me off of the game for a very long time, and I pocketed it away in my mind as the beautiful euro too mentally taxing to really be worth it. But over the past couple of months, distanced from specific knowledge of these advanced strategies, I’ve rediscovered the fun in Tzolk’in. It’s still a mental grind, but it doesn’t have to be an oppressive one. The trick is to set modest expectations for yourself. The monuments, visible from the start of the game, fill the role of “end of game victory point generator” that you’ve seen in other games. They’re expensive, but they give you points based on how many green buildings you’ve built, or how many times you’ve gathered wood, or how far up a particular temple track you are, etc. They neatly provide goals you can build your broad strategy around. Also consider the fact that, when you remove workers, you can remove them and trigger their effects in whichever order you want, which rewards players for planning their moves precisely. Maybe you use one worker to gather resources, then advance a skill that gives you victory points when you purchase buildings, then use the previously gathered resources to fund a building purchase. Chaining all of that together just feels good. But don’t worry, if you don’t precisely line up your actions, you can pay corn to backtrack and take a previous action on the track. But what is that, really? A corn of shame. Shame corn. The most devious little mechanism housed in this smorgasbord of moving parts is a once per game ability that players can take only if they use the “become first player” spot when placing workers. If they wish, they can then rotate the gear two notches instead of one. Do this right before a “food day”, catch an opponent unaware, and you can force them into a significant victory point penalty from not being able to feed their workers. Or, use this ability in order to not only take first player, but to advance your worker suddenly to the “purchase a monument” space to grab that high-point tile before your competitor. It’s mean and I love it. It forces you to be aware of your opponent’s strategies and plans on an entirely new level. However, Tzolk’in is not without its flaws. As I mentioned before, it’s a merciless game, and on your first couple of plays you’ll probably get the impression that the game concludes too quickly. There are four food days, and for the first two you’re probably just going to be trying to accomplish something while not starving your workers. The second half of the game is going to whiz by. After you start to get a feel for the game, though, I think it’s just about the right length. At roughly 30 minutes per player it packs a lot of mental crunch into a relatively short amount of time. That is, of course, unless there are people at the table prone to analysis paralysis (AP). For them, this game might be a doozy. There is so much to think about, not only in terms of how to most effectively manage your corn and resources and economize your actions, but also in terms of trying to predict what your opponents are going to do. Layered into that is a very strong visual and mechanical presence of acting through discrete units of time that makes the calculations that much more complicated. I’ve been able to embrace a satisficing mindset with this game, but I don’t necessarily think it will be easy for others to do so. It’s also not necessarily fun if you make a poorly-thought out move. One of the metrics we always mention when evaluating games is: “is it fun when you lose?”. I think there’s a lot to admire about the design, look, and feel of playing the game, but it can be completely frustrating to mess up on a calculation knowing that the end of the game or the next food year is right around the corner. Sometimes you’re going to feel like you’re piloting a well-oiled machine, and sometimes you’re going to have a more Chaplin-esque experience. I also have to dock it a bit for not feeling particularly thematically cohesive or exciting. Again, the graphic design, the art, and the gears themselves are beautifully done, but they can’t distract from the fact that you’re placing cylinders in order to gain cubes in order to purchase tiles. It’s a well-constructed machine, but in some ways only merely a machine. I’m so glad I’m getting back into Tzolk’in. Right now I feel like I’m in a fantastic sweet spot–knowledgeable enough to accomplish the goals I set my mind to, good enough to try out new and different strategies, but not bogged down in the mental strain of trying to solve the game. From what I remember reading those BGG strategy discussions, at high levels there’s some debate whether or not the “big corn” strategy is powerful enough to be imbalanced. But frankly I don’t care. I don’t want to reach that level of mastery. I just want to enjoy the ride.